SKY MAP: For Feb. 16 at 6:30 p.m. from mid-northern latitudes. This is the time of the year when I get lots of inquires concerning a certain very bright starlike object shining over toward the southern part of the sky. It's Sirius, the Dog Star, the brightest star in the night sky. Although currently Venus shines about eight times brighter over in the western part of the sky, it's gone by 8 p.m., leaving Sirius to glow radiantly as the brightest object in the sky until it sets during the early morning hours [Sky Map]. Several astronomy books suggest that you can locate Sirius by using the belt of Orion; that the belt points southeast directly toward Sirius-as if anyone needed a way to find this dazzling luminary! While it is true that Orion's three-star belt will direct you toward Sirius, all anyone needs to do is simply cast a glance toward the southern sky these cold winter evenings and you'll immediately see it. 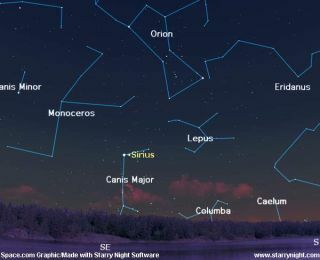 It will be due south this week between 8:30 and 9 p.m. local time all of this week, and sets in the southwest between 1:30 and 2 a.m.
Sirius is the brightest star of the constellation Canis Major, the "Greater Dog" in Latin. According to Burnham's Celestial Handbook other names for it include "The Sparkling One" or "The Scorching One." The star appears a brilliant white with a tinge of blue, but when the air is unsteady, or when it is low to the horizon it seems to flicker and splinter with all the colors of the rainbow. At a distance of just 8.7 light years, Sirius is the fifth-nearest known star. Among the naked-eye stars, it is the nearest of all, with the sole exception of Alpha Centauri. Over thousands of years, Sirius appears to move in a wavy line across the sky. In 1862, Alvan G. Clark first saw Sirius B, also known as "the Pup," the companion star responsible for the wiggle. Sirius B is only one ten-thousandth as bright as Sirius A, but by 1914, spectroscopic observations had demonstrated that its temperature was about the same. From physical laws it follows that B emits the same amount of light per unit surface area as A, therefore to be so dim it must be very small. Later calculations have shown that A has just over twice the mass as our Sun, but B has nearly one solar mass. Since it is so small, B must be exceedingly dense. In fact, it packs 98 percent of one solar mass into a body just 2 percent of the Sun's diameter. To do that, Sirius B must have a density 90,000 times that of the Sun. A teaspoon of this star material would weigh about 2 tons. This is also the time of the year for southerly observers to look for Canopus, in the constellation of Carina, the Keel (part of the now-defunct constellation of Argo Navis, the Ship). Canopus still holds its rank as second only to Sirius in apparent brightness. They differ by 0.8 magnitude, so that Canopus is about half as bright as Sirius. But the former is more than 34 times as distant from us. And, in fact, intrinsically the luminary in Carina outshines the one in Canis Major by about 600 times. Anywhere south of latitude 37.9 degrees north latitude can get a glimpse of Canopus as it skims just above the southern horizon, almost directly south of Sirius between 8 and 8:30 p.m.